I though this was a wonderful blog and the document attached is well worth reading!. Today, the Conference of Presidents of Major American Jewish Organizations is celebrating 67 years of the special relationship between the United States and Israel, partners in democracy, their people bound by common interests and values. 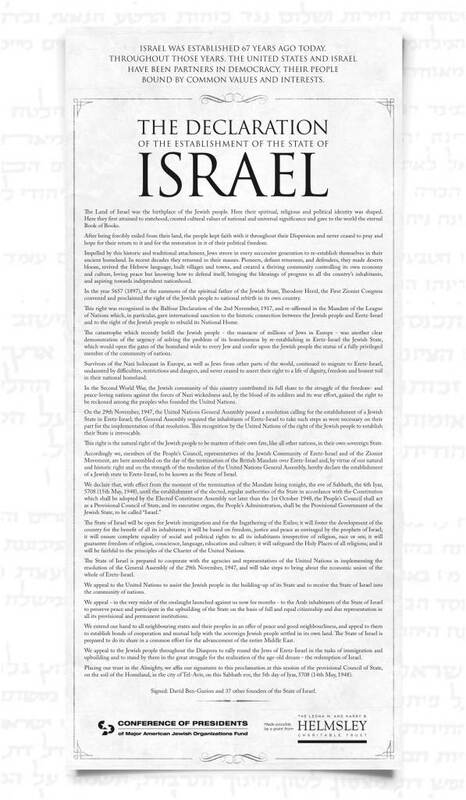 They are sponsoring a full-page reproduction of the Declaration of the Establishment of the State of Israel in newspapers across the country (Wall Street Journal, USA Today, LA Times, and Washington Post) in honor of Israel’s Independence Day. My husband is sponsoring a Support for Israel rally on May 14th of this year in Crossville, TN.